Favorite Sweet Potato Dish:—Sweet potatoes nachos—use the sweet potatoes as chips, bake them then put beans, corn, bacon, salsa, cheese, and avocado on them! Yummy! Why I became a Sweet Feet Member: Some members of our Tuna Team, also known as “The Pack” mentioned this as an opportunity to learn more about the health benefits of sweet potatoes and running. I’m always looking for ways to improve my running, efficiency and nutrition wise. Favorite Race: Outer Banks Marathon November 201. This was my first marathon and I trained diligently, consistently and during a hard time in my life. It showed me I’m a lot stronger than I realize as I ran the race solo, with no friends, just me and a few hundred strangers! I loved absolutely every minute of the race and can remember each mile! What got me running: I had a big work event back in 2012 and when I returned from it, I needed to decompress from that event. I took up running as a way to release stress but also for the physical benefits as well. 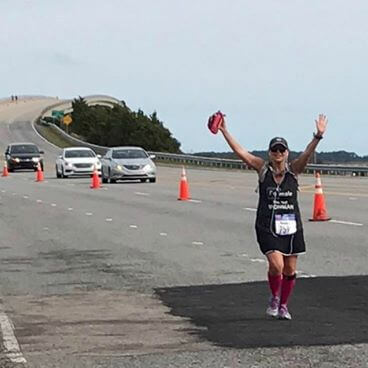 My picture is from my first marathon-around mile 23 after I ran the big bridge –the bridge everyone said runners walk—I ran it! I started running in 2012 and since have completed three half marathons, two marathons and am running the NYC Marathon in November of 2018. Running has given me confidence and freedom that I didn’t know I had in me! In 2017 I set a goal to run 1000 miles in the year, and ended at 1100. A litle about me: My name is Mandy Steelman and I am originally from Winston-Salem, NC, graduated college from Appalachian State University in 2000. I’ve been in the legal field for approximately 20 years, starting in college in a private firm, then after graduation moving to Raleigh and working at the United States Attorney’s Office. I have two children, Corbett age 10 and Airlie age 8. Corbett has the most gentle, pure spirit and Airlie is my mini me. I started running in 2012 and have done three half marathons, two marathons and am running the NYC Marathon in November of 2018. Running has given me confidence and freedom that I didn’t know I had in me! In 2017 I set a goal to run 1000 miles in the year, and ended at 1100. Running has also allowed for me to make great friendships, which have turned into my “family”. I met my person (we are too old for boyfriend/girlfriend titles!) Whit, thru running and it’s allowed us to do something together that we both enjoy, gives us quality time to talk and allows for each of us to hold the other accountable. He makes me a stronger runner every time we run together.